Celebrate your friends and family with beautiful art, handcrafted jewelry, pottery, pens, candles, soaps, lotions, stationary and more. Many of these fine gifts are handmade by local artists and craftspeople. Visiting Lemons & Sugar is a treat for the senses. Feast your eyes on original paintings and photographs of the Palos Verdes Peninsula landscape and Pacific sunsets. Citrus, lavender and other exotic scents in personal care products, sachets and diffusers will take you away to a place of relaxation and luxury. Caress your touch with soft linens, hand embroidered pillows and one of a kind scarves. You’ll find colorful jewelry in styles not seen anywhere else. From big and bold, to delicate and sweet, Lemons & Sugar has just the right baubles and bangles to make gifts special even when there is no occasion, and wrapping is complimentary! The children’s corner features whimsical plush toys, vintage books, sweet treats and one of a kind gifts sure to delight the tiniest of friends. Delicate paper mache fairies dance over head in mobiles, created to inspire and uplift -- sure to bring out the youthful spirit in everyone. Shop owner, Lis Walter, will help you select the perfect gift. Her passion for all things ‘hand made’ inspired her to open a shop filled with unique items. The joy of creating was instilled in Lis at a young age by her mother who encouraged all her children to explore art hands on. Living and traveling abroad also expanded her appreciation of unique crafts and diverse objects of art. Although Lemons & Sugar carries creations from as far as Canada, the shop’s focus is on the many talented artists who reside in our South Bay’s special community. A small, local business, LEMONS & SUGAR is your new shop for creative, ‘one of a kind’ gifts and home accessories. Coming this spring, classes for all ages will be taught in the shop’s studio. Kids’ arts and crafts, adult flower arranging, tile painting and instruction on ‘how to go green‘ are all in the works! If you are interested in any of these classes e-mail us at shop@lemonsandsugar.com to get on our mailing list. 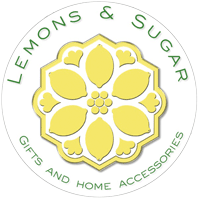 LEMONS & SUGAR, a gift and home accessory shop, is located right next to two other new boutiques, Doll House and Poppi on Palos Verdes Drive West by Pronto’s and the Lunada Bay House restaurant. Designed & Developed by Forte Web Properties, Inc.